The month of January has two birth flowers. The first is the carnation which comes in several different colors that convey different meanings, just like roses. A pink carn means affection, while a read carn means love, white carnations mean pure love, and striped carnations means regret that a love is not shared, and yellow carns mean rejection or disappointment. The other January flower is the snowdrop which signifies hope and beauty. Carnations are favored for their fragrance and hardiness. Many feel that the carnation signifies love, fascination and distinction. The striped carnation conveys a secret message --- I wish I could be with you! The carnation is a eurasian plant with pink to purple-red spice-scented usually double flowers widely cultivated in many different varieties and colors. The scientific name of a flower species is formed by the combination of two terms which are the genus name and the species descriptor in case of the carnation the Dianthus caryophyllus. Other names for the carnation include clove pink and gillyflower. The flower has been cultivated for the last 2,000 years. The name "carnation" is derived from the words "coronation" or the Greek word "corone" which means flower garlands. Snowdrops bloom in the wintertime and there are about 20 varieties of Snowdrops that nearly all flower in the winter. They are actually rare in the wild and picking them or collecting the bulbs is forbidden. International law prevents their import and export without a CITES permit. When found in the wild there are often many of them growing together in what is known as a snowdrop carpet, often in light woodland. Common names are 'Mary's Tapers' and 'Candlemas Bells'. There are many legends surrounding the snowdrop. One stems from Eve and the Garden of Eden. Another from German legend says when GOD made all things on the earth, he asked the snow to go to the flowers and get a little color from them. Many flowers refused except for the snowdrop. As a reward, the snow lets it bloom first whenever spring shows. There are too many legends to list. According to superstitions it is unlucky to bring snowdrops indoors at the sight of a single snowdrop blooming in the garden foretells of impending disaster. It is regarded as an omen of death despite its beauty, although it symbolizes purity and hope in the language of flowers. No matter your choice of January birth flowers, Snowdrop or Carnation, the sight and meaning of both are very thoughtful. To me they both resemble SNOW, which we get a lot of in the month of January. Both are very hardy and long-lasting. 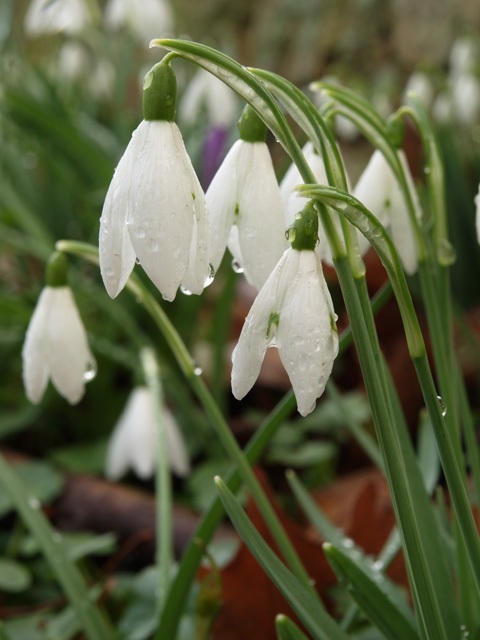 In fact, snowdrops can bloom all year round should you choose to grow them in your garden. Carnations are mostly loved for their long life in cut flower arrangements.